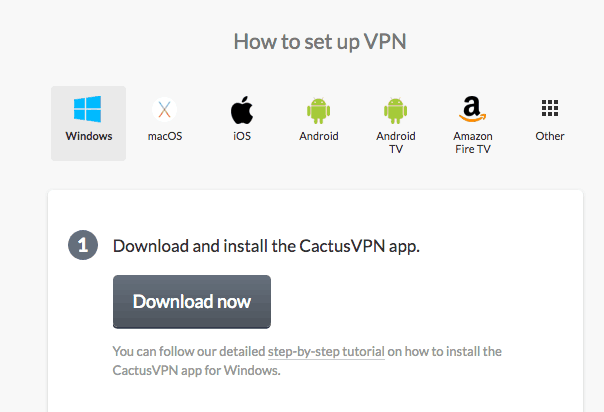 CactusVPN is a Moldova-based VPN service from CactusVPN Ltd. It claims to offer its users anonymous browsing, hidden IP address to bypass geo-restrictions and top data protection – OpenVPN tunneling protocol with 128-bit AES encryption. Moldova is a little Eastern European country, located next to Romania and Ukraine. On the plus side, it’s a privacy-friendly place. But on the downside, CactusVPN has very small server network with only 23 servers in 14 countries. That’s exactly what we set out to find in this CactusVPN review. We signed up, ran them through a series of tests, and compiled this data-driven review to reveal the answer once and for all. CactusVPN starts strong with a no-laughing-matter logging policy. The follow it up with a local jurisdiction outside any pesky security agreements. And they’ve doubled-down by supporting up to six protocols and working across a variety of platforms, including the Tor browser, Smart TVs, routers, and games consoles. They even sweeten the deal with a kill switch and DNS leak protection. Take a look for yourself. CactusVPN does not collect logs on anything. And when we say “anything,” we mean NOTHING. But in this case, CactusVPN means it. They won’t track browsing history, connection logs, DNS logs, or any other traffic logs. Of course, they’ll need to keep payment records. However, if they have no connection logs to match them to, you should be golden. Moldova is located outside any data-sharing intelligence agreements. VPNs can mask all types of legally-questionable behavior online. But the companies behind each can’t always protect their users when the local authorities come calling. Most won’t hesitate to hand over data when pressured by governments. And if their home country is located inside one of the Eyes alliances, that data will also be turned over to most civilized countries around the world. Moldova doesn’t play that game, though. Any other government request for your records is going to be politely — or impolitely — rebuffed. This, on top of a legitimate ‘no logs’ policy, implies that CactusVPN has your back. CactusVPN supports OpenVPN, L2TP/IPSec, IKEv2, SSTP, SoftEther, and PPTP. OpenVPN will generally be your go-to. But the other protocol options come in handy for specific devices (like IKEv2 on iOS), or outdated, sluggish connections. Most VPN’s we’ve reviewed offer some mix of these six. However, one slight difference from the rest is that CactusVPN has opted to only offer AES-128 encryption. Technically speaking, this is less secure than the beefier AES-256 option. Their logic is that the difference is slim. And they kinda have a point, practically speaking. Most hacks won’t be through your encryption. They’ll try to go after simple errors or user negligence, first. If you’re on an older device, this lower encryption will also come in handy because AES-256 puts extra strain on the computer’s CPU). CactusVPN also adds a built-in kill switch to their VPN clients. But you’ll have to switch it on, first. It’s not enabled by default, so you’ll need to go into the app’s settings and manually switch it on to protect yourself from accidental leaks when your Internet connection drops. There’s not much to say about the CactusVPN client. And that’s a good thing believe it or not. No major lags, crashes, or other complaints while using it. Next, you’ll be taken to a page with one-click download option for your device and operating system. 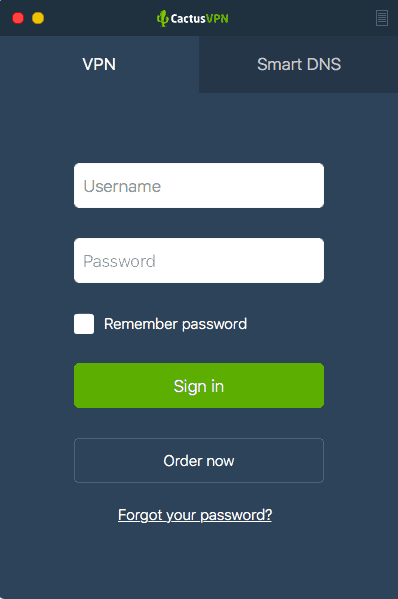 Login with your customer account details and customize your server location preferences. 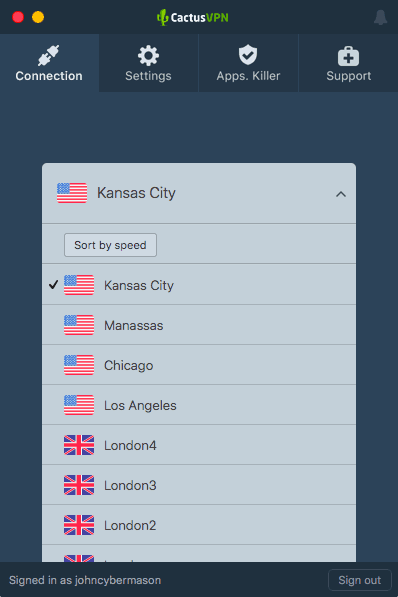 By default, they are sorted by country. But you can also sort them by speed. Then choose your server and click the green “Connect” button. That’s it. The only annoying thing about the whole process is that in order to change servers, you need to disconnect from the current one. So make sure you have that kill switch enabled, first, before disconnecting to switch around. Interestingly, they have also offered a related service called SmartDNS. Cactus provides a test so you can figure out which is the right choice for you. More on this extra feature down below. It’s pretty standard for most VPNs to support Windows, MacOS, iOS, and Android devices. But those aren’t the only ways you connect to the Internet today. And the problem is that if your VPN provider doesn’t make a ready-made client for each unique platform, it’ll require technical expertise or lots of troubleshooting to finagle a workaround. Their service is compatible on everything from the Amazon Fire TV to Linux Ubuntu, Chromebooks, Boxee Box, routers, games consoles, and other Smart TVs by Apple or Samsung. Geez, that’s a lot! After that long list, it shouldn’t come as a surprise that CactusVPN also works with the Tor browser. The Pros are stacking up! A flawless product can be derailed by one bad customer service experience. You’re going to be left with a sour taste in your mouth if the company can’t step up to the plate and help when it matters most. That’s exactly why we test each and every VPN’s customer service quality, response time, and overall friendliness. CactusVPN also offers live chat. However, I decided to try their email support: I sent an email over with a few general questions. At this point, most companies will take around a day to get back to us. The fastest times we’ve seen clock in somewhere around a few hours. Incredibly, it only took CactusVPN four minutes to offer a custom reply. You know, from like an actual human being. I even tried to trick them with a few follow-up email replies. But each time, it only took a few minutes for them to answer. 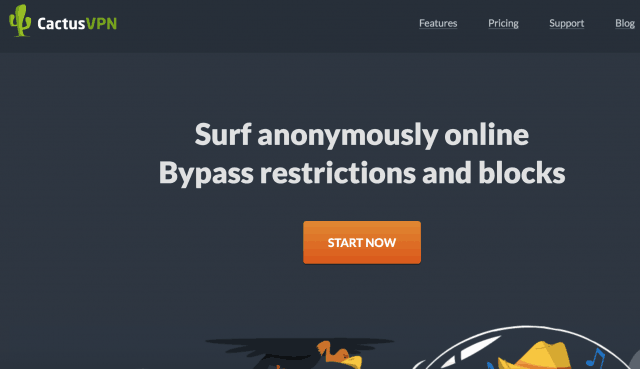 Anonymity is the name of the game for a VPN. And thankfully, CactusVPN’s connection delivered on that promise. We put them through a series of DNS leak tests, to see if they were accidentally exposing your real location. Before we break out the champagne and celebrate, there was one more thing to check. You’d think a VPN’s install files would be legit. But we’ve seen enough shady stuff over the last few years that we no longer take anything for granted. 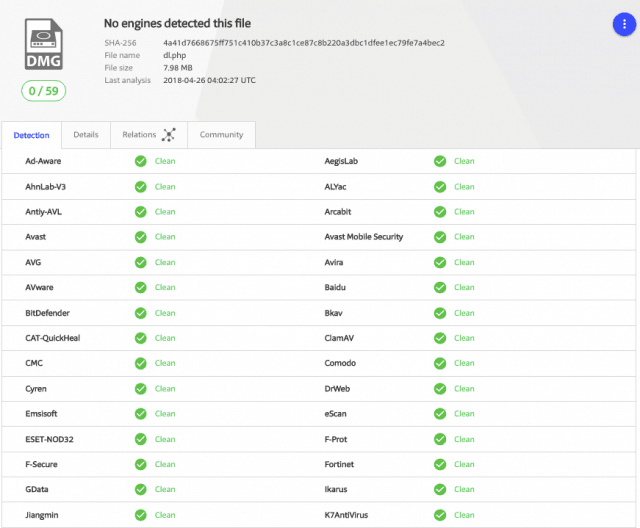 So we uploaded the CactusVPN install files to VirusTotal scan to check for any last-minute virus or malware. We got a troubling warning at first. But tested them again and they passed cleanly on the second go around. The first was most likely a false positive. So you’re good to go! I didn’t know what to expect with little-known CactusVPN. I’d never really heard of them before trying out there service. But the initial experience was pretty encouraging. Unfortunately, there were a few issues along the way. Each popped up once we started putting them through a few tests. Here are the biggest problems we found. Remember the protocols and encryption section above? CactusVPN opts for AES-128, rather than the bigger version, because they claim that it should help performance across the board. In other words, they’re OK with sacrificing a little security for a lot of speed. CactusVPN’s speed was only able to come in 39th place out of the 78 VPNs we’ve reviewed. Not terrible. But not good considering a bunch of ‘bloated’ AES-256 encryptions bested them. And we feel comfortable saying that because each VPN gets the same test treatment. Our normal connection speeds clocked in at 97.00 Mbps download and 53.00 Mbps upload. Then, we connect to a few different VPN servers and retest to measure the difference. The download speed is OK I guess. But the upload speed is incredibly slow. Over 80% slower, at 10.21 Mbps, is practically unusable. The EU server was only able to perform slightly better. There wasn’t really much of a difference between the US server and the EU server, to be honest. Normally, you can point to different factors, like server location, as the underlying reason for poor performance. The further away you’re actually sitting from the server you’re trying to connect, the lower connection speed you can expect. Except, when you have servers on two different continents with virtually the same (slow) speed, that’s not a distance issue. That’s a company-wide issue. And it’s troubling. The CactusVPN website claims to be able to unblock dozens and dozens of services. The very first one on their list, as pictured above, is Netflix US. Except for one teensy, tiny problem. I tried accessing Netflix on all four of their U.S. servers. And none of them worked. When I asked customer support about this, they told me that their VPN does not unblock geo-blocked content (that was a mouthful). So if you want that, you need to pay for a separate service called SmartDNS. Boo. Many VPNs throw this stuff in for free, without cross-selling you an additional product. Switching your theoretical location is kinda the whole point of using a VPN. I’d recommend these other VPNs for Netflix, instead, if you’re trying to stream foreign content. 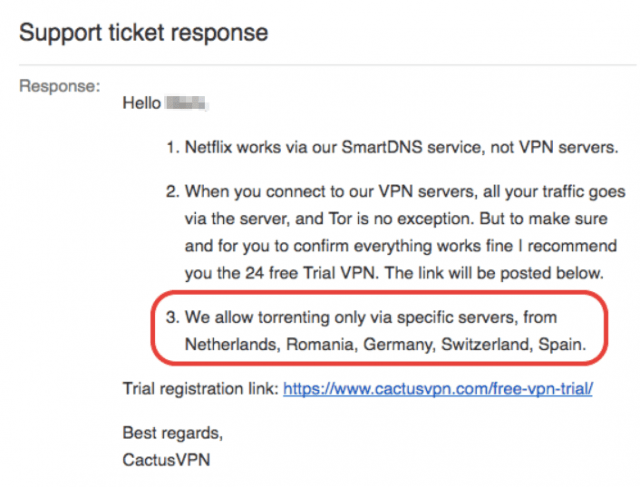 On the one hand, CactusVPN allows torrenting. Except, they only allow it on a few selected servers. Because as we already alluded, the farther you’re physically from a VPN’s server, the slower your connection will be. Currently, the only torrenting-friendly servers are in Europe. Cool if you’re in Europe. Not cool if you’re not. But that’s only the first potential performance issue that will plague your CactusVPN torrenting experience. There are only a handful of torrenting servers available, which means they’re likely to get overcrowded by other people with the same end goal in mind. Overcrowding often means your server’s resources get spread too thin. And in addition, these torrenting servers are banned on two of their three packages. That means you’ll need to shell out for the most expensive plan to access servers that probably aren’t going to be very quick. CactusVPN starts around $3.49-$4.89 for month-to-month plans (an automatic 30 percent savings). From there, you can save around 40% by prepaying quarterly ($3.03-$4.19 a month). Or you can even cut about 54% by paying annually ($2.27-$3.20 a month). Their extra SmartDNS product is $4.89 a month, $4.19 a month quarterly, and $3.20 a month annually. You can pay for these products using your favorite credit or debit card. 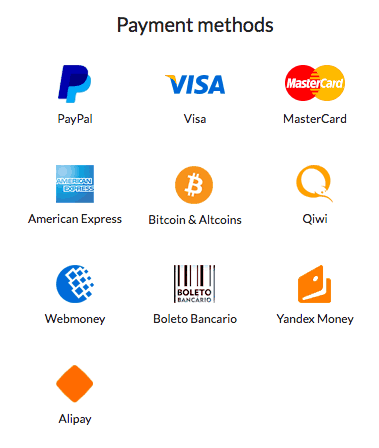 You can also use a few different third-party payment gateways, like PayPal. Or you can even use Bitcoin and Altcoins. Great for people who are interested in anonymous payments! Cash is not supported. Neither is waxing the CEO’s car for account credit. They offer a free 24-hour trial period, along with a 30-day money-back guarantee. 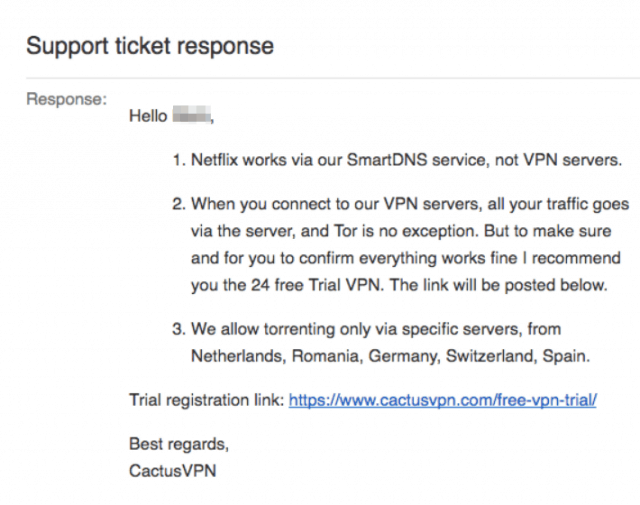 So you can try out both the VPN software and SmartDNS before ponying up any cash. Nice! CactusVPN came in 42nd out of 78 VPNs overall. They were solidly middle-of-the-pack in most areas. We were initially encouraged by their plethora of protocol options and device compatibility. The client worked just as advertised. And their customer support was truly excellent. Their sub-five minute email replies were lightening-quick compared to some competitors that have taken days (if not weeks) to respond to us. But things started sliding quickly when we started up the speed tests. Neither of which was fast, unfortunately. And that’s even accounting for the lower-than-normal encryption standard that’s supposed to improve this very attribute. Netflix didn’t work at all. And torrenting/P2P compatibility has more rules than a… well, let’s just say there are A LOT. Overall, it’s OK. Not awful, but not awesome, either. 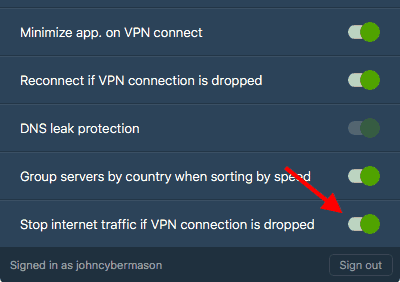 I’d recommend a more well-rounded option like NordVPN or ExpressVPN.